The smug and cocky criminal former FBI Director James Comey, responded to the release of the Nunes memo with his customary posture of elitist superiority and unbridled arrogance. The memo shows that Comey conspired with the Clinton campaign to fabricate evidence and then used it as the phony basis for a FISA warrant in order to spy on Americans, including President Trump. It also is shown that the warrant was renewed multiple times by Comey and others despite having the knowledge that it was unlawfully obtained, that the court had been deceived through the use of false evidence and that there was no Russia-Trump connection in the pursuit of political objectives. It is exactly what we were told it would be, the weaponization of the Department of Justice and the FBI. 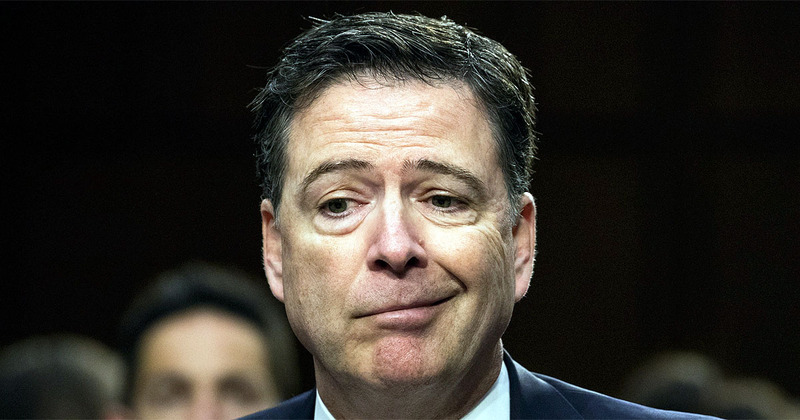 A likely relieved Comey, knowing the breadth of information the memo could have contained, sent out a dismissive, taunting tweet upon the release, saying, “That’s it?” No Mr. Smarty Pants, that’s not it. That’s just the first revelations, the unclassified part, you should be so lucky. If it were you’d still be headed to prison. The memo was neither dishonest or misleading, unlike Comey and the criminal Democrats of the Obama-Clinton-Soros Mafia. It did not wreck the intel committee, although it did cause quite a bit of consternation among the railroad crew attempting to cover for their party’s treasonous acts and conflict with the Republicans for being willing to expose them. The intelligence community as well as the DOJ and FBI are the ones who have committed any offenses responsible for the degradation of the relationship with the intel committee, not the other way around. And that classified investigation of that American citizen was knowingly based upon a phony political document, so it was illegitimate, and abuse of power and a criminal act both against that American, Carter Page, and the FISA court Comey and his co-conspirators manipulated. DOJ and FBI must keep doing their jobs, that is the sole truthful thing that he says. He left out the part about their corrupt leadership being called before grand juries and locked up for the remainder of their miserable, treasonous lives. Keep it up Comey, that’ll make it a lot more gratifying and entertaining when you are led out of a courtroom in handcuffs. what that COMEY ARROGANT TREASONOUS SOB is not getting. it was HIM, THE MUSLIM FRAUD, AND OLD HILLARY BEAST WHO WEAPONIZED THOSE AGENCIES. now it’s TIME TO PAY THE PIPER I PRAY. We can only hope that for once they will be held accountable.